Kintsugi is one of the most popular restoration methods for broken ceramics in Japan. It is basically done with raw lacquer and very fine gold powder. I learnt this skills when I was reading Japanese literature at the Meiji University in Tokyo. Please visit my webpage to find out a little more about this. 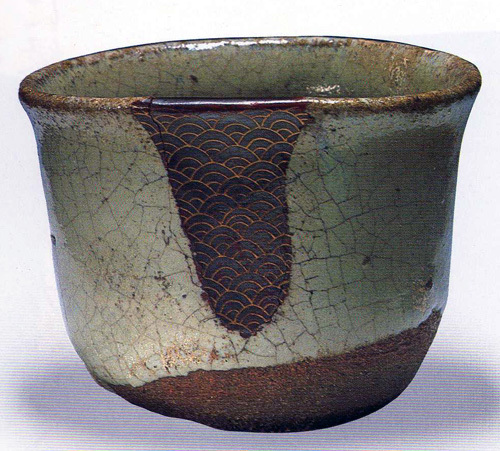 This famous Karatsu gui-nomi (sake cup) is from the Tanakamaru Collection in Hakata, Kyushuu. You will notice the ‘seikaiha‘ (blue sea waves) pattern on the big repair. I think it’s rather elegant and I would be delighted to drink good sake out of it and get jolly drunk. This entry was posted in anagamania and tagged kintsugi, sake cup. Bookmark the permalink.